Alison Kim began studying the violin at the age of four and her early principal teachers include Lawrie Hill and Taras Gabora. Currently she studies with Kristopher Tong of the Borromeo Quartet at the New England Conservatory. Additionally, she has performed in masterclasses for Cho-Liang Lin, Vadim Gluzman, Weilerstein Trio, Mihaela Martin, and more. In 2018, she was a recipient of the National Youth Orchestra of Canada (NYOC) Award of Excellence and consequently toured Canada, Germany, and Scotland as co-concertmaster. 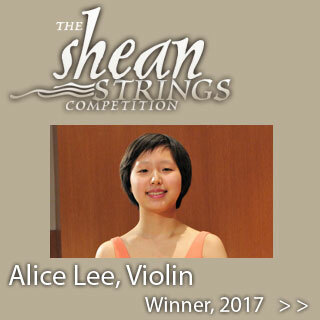 Through NYOC she performed both solo and chamber works at the Toronto Summer Music Festival and the Ottawa Chamber Music Festival. She also received a full scholarship to attend Morningside Music Bridge at the New England Conservatory in 2017. Within Canada, Ms. Kim has received top prizes at the Canadian National Music Competition, the VMO Concerto Competition, the VAMSO Concerto Competition, and the VYSO concerto competition and has performed as a soloist with the Vancouver Metropolitan Orchestra, the Vancouver Academy Symphony Orchestra, the Vancouver Symphony Youth Orchestra, and the Vancouver Academy Intermediate Orchestra. Ms. Kim is a member of the Nico Quartet which was chosen as an Honors Ensemble to represent NEC for the 2018-2019 academic year, and she was previously a member of the winning quartet in the Friends of Chamber Music Competition. She is a two time recipient of the BC Arts Council scholarship and the 2018 recipient of NEC’s Beneficent Society scholarship.